The Raiders may now have only two wins to their name in 2014, but they have two sweet wins, as Sunday they topped their Bay rivals the 49’ers, beating them soundly 24-13. The win puts the team at 2-11 on the season, and it’s the second home win in three weeks for the team. The silver and black were crushed last week 52-0 by the Rams, but recovered and rookie QB Derek Carr was the best he’s been all year, throwing three touchdowns in the win. 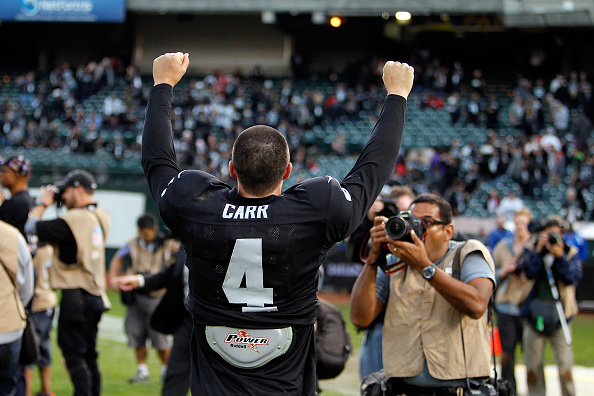 Carr completed 22 of 28 passes for 254 yards and completely outplayed counterpart Colin Kaepernick. The offensive line did a great job helping Carr, who rarely faced any pressure, giving him plenty of time to find open receivers downfield. He hit Mychal Rivera down the middle for a 27-yard gain and completed all five of his passes for 73 yards on the go-ahead drive capped by a 9-yard pass to Marcel Reece that made it 17-13. 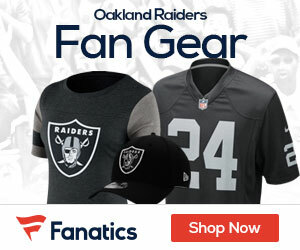 After a three-and-out by the 49ers, Carr led the Raiders to their first consecutive TD drives of the season with a 5-yard scoring strike to Rivera, who had a career-high 109 yards receiving. The 49ers’ chance at a comeback ended when Kaepernick was sacked on third down from the Oakland 25 and Phil Dawson missed a 47-yard field goal with 5:03 to play. Kaepernick then threw an interception to Charles Woodson with 2:36 left to seal it. Kaepernick finished 18 for 33 for 174 yards with one touchdown, two interceptions and five sacks as San Francisco failed to score 20 points for the sixth time in seven games. The game got off to a rough start for the 49ers. Kaepernick threw an interception to Brandian Ross on the first play from scrimmage, setting up a 57-yard field goal by Sebastian Janikowski. The Raiders went back ahead 10-7 on a 3-yard touchdown pass to 330-pound tackle eligible Donald Penn, who bowled over Eric Reid at the goal line and then leaped into the Black Hole for a beer-doused celebration. It was Penn’s third career TD catch and second against the Niners, having also caught one in 2010.